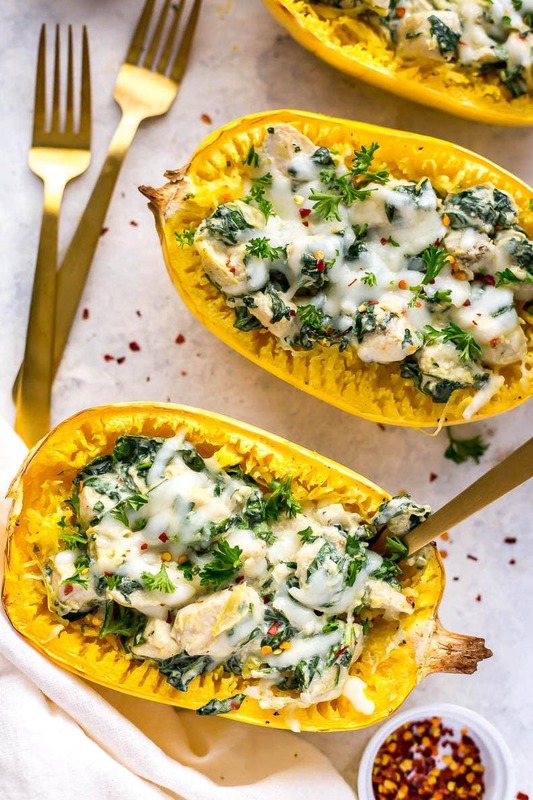 These Chicken, Spinach & Artichoke Spaghetti Squash Boats are a delicious low-carb dinner idea that tastes just like a creamy spinach & artichoke dip made healthier with goat cheese! Preheat oven to 425 F. Microwave squash one at a time for 2 minutes each. Slice in half and scoop out seeds. Place on a parchment-lined baking sheet and drizzle with 1 tbsp olive oil, then season with salt and pepper. Bake for 30 minutes. Meanwhile, add 1 tbsp olive oil to a large skillet. Add chicken and saute until lightly browned, about 5-6 min. Season with salt and pepper, onion powder and chili flakes. Add artichokes, spinach and goat cheese, stirring for about 1 minute or until spinach softens. Remove spaghetti squash from oven and scrape with a fork. Divide spinach mixture among each spaghetti squash half, then top with mozzarella cheese. Bake another 5-10 minutes until cheese is melted. Serve and enjoy!